Having a Drink in the Parking Lot - Turns Out to be a "Smashing Idea"
This photo was taken on October 26, 2018 at 2:47 PM. The location was in the parking lot of the strip mall in which is located the branch of the bank which I use for my checking accounts. I took the photo and proceeded into the bank to took care of what needed tending and returned to the car. I got one more glimpse of the intertwined cans before leaving. Shortly after having gotten back out on the road - I put the image through that humanizing filter which seems to reside in my imagination inventory. Once in this mode - I was able to have the cans be friends - that had their drink (which happened to be their contents - lol) and once this was accomplished - the cans were up for grabs for whatever might happen next (such as someone picking them up and putting them into the trash - or in this case - running over them with a vehicle - who knows by how many different vehicles). To those I showed this photo to - all joined me - in a laugh at how words with their implied meaning were able to be attached and turn out an ever so simplistic bit of fun. Here is hoping you were able to join us in the smile of this easy imagination exercise. 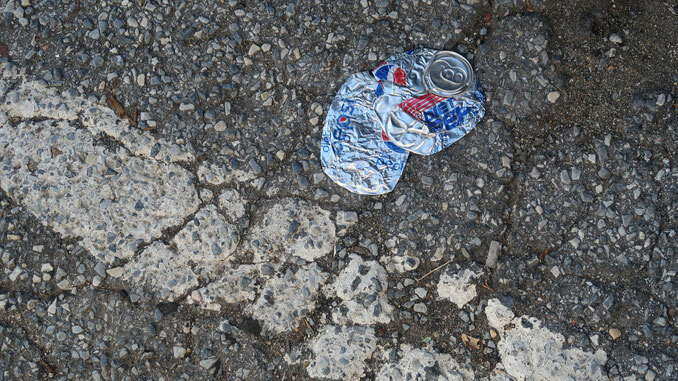 Wow, that's one of the Diet Pepsi cans from the 80's and 90's. Old school. They must have done a "throwback" design on the cans. Either that, or someone drank a very old Diet Pepsi, in which case their stomach probably felt how that can looks shortly after drinking it lol. Its interesting to get sort of a behind the scenes glimpse into how your imagination works. I'm a coke guy myself. The title you came up with cracked me up! One can is the current, modern pepsi can and the other can is their original can. I almost feel like something about their placement was intentional, very odd to see both together like that. Great catch!